Grandma still loves to hold hands. Grandma’s decline has continued. She no longer gets out of bed and is no longer verbal, other than an occasional word or series of unintelligible grunts. Her eyes are distant and usually vacant. She has stopped eating and is barely getting any fluids at all (though we are trying to make sure she at least isn’t dehydrated). 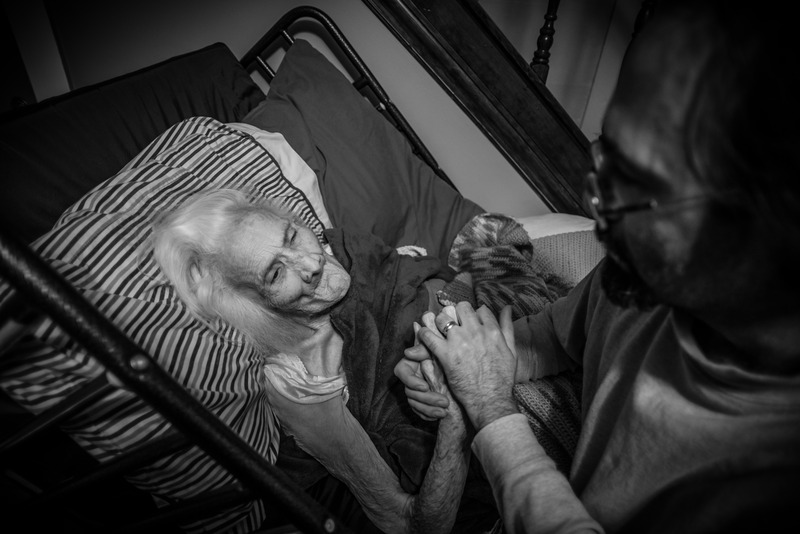 Calls to Hospice are becoming an almost daily occurrence. Whether it’s to report some new symptom or to ask advice on what kind and how much medication to give her, I am getting to know the staff there really well. They’re awesome. Every time I call (even if the person on the other end of the phone isn’t someone I’ve talked to before) they are so helpful, concerned, compassionate and just…wonderful. They always ask how I’m doing. Care for the caregiver. I’m humbled. The work those people do is saintly. They care for those who can’t care for themselves during some of the hardest and most vulnerable moments of their lives. I know it’s their job…but most of them (especially the nurses) could get jobs elsewhere. They CHOOSE this work. That, to me, is incredible and I am more than grateful for their kindness and guidance right now. My brother and sister-in-law have been here for a few days, which has been a lifesaver. They’ve stepped in to do a lot of the day-to-day care that I had been doing. I’m glad Brandon got here while Grandma was still alert and capable of coherent communication. It cheered her a lot to see him. Grandma was really happy to see Brandon when he got here. We spend a lot of time now holding Grandma’s hand and stroking her hair. This morning as I was leaving to go to a class for work I bent down and said good morning to her. Her eyes fluttered open a little and she said “Guh muh”…then reached up and put her hand on my face. Tonight, when I got home I said hello, and she opened her eyes a little, grabbed my hand and wrinkled her nose at me. It’s little things like that that let me know she’s still in there. She’s confused and probably a little bit scared, but she’s still got the energy to pull faces. We’re doing our best to keep her comfortable and feeling safe and loved. It’s all we can do. I know it won’t be much longer, but I am so thankful for this time. I’ve given her permission to go when she’s ready. The rest is up to her. 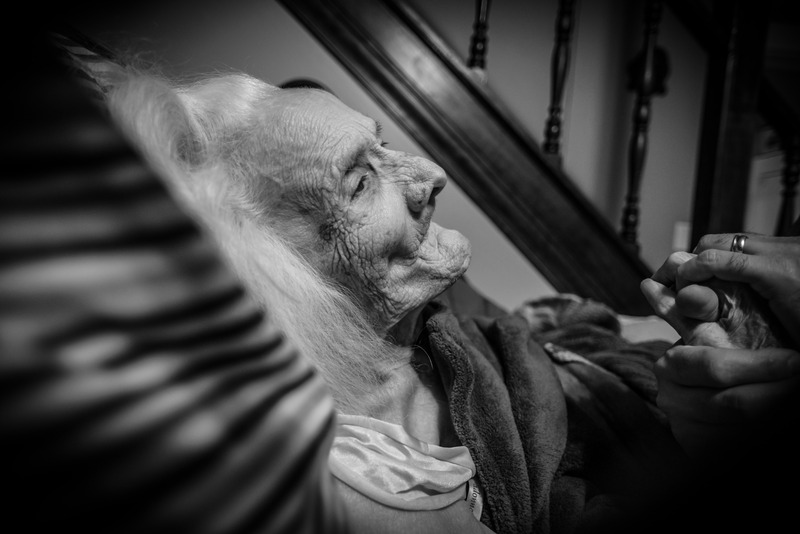 This entry was posted in Aging, Caregiving, Day to Day and tagged 101, aged, ancient, care, caregiver, caring, death, emotional, emotional toll, exhaustion, family, grandma, grandmonster, grandmother, independent, senior, sense of humor, sweet old on October 19, 2013 by Rob Jones.